Last month marked an important milestone in the centre's journey to become a yogic hub for the UK and Europe. 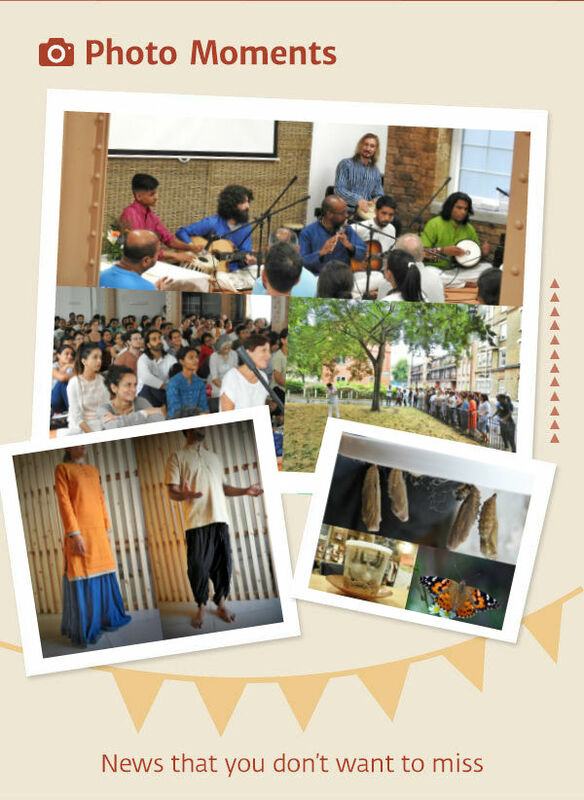 On the 27th July we were delighted to offer our very first Guru Purnima celebrations. We were humbled by the overwhelming response; the centre was jam packed, creating a beautiful atmosphere of love and devotion. As a symbolic gesture to capture the metamorphosis of a seeker on the spiritual path, here in the centre, over the last few weeks, we have been following the journey of caterpillars from their cocooned state to fully grown butterflies. The Guru Purnima celebrations were kicked off by the releasing of these butterflies. They provided a timely reminder of the wonderful things that happen when one's energy is focused on inner transformation. The evening progressed with the streaming of Sadhguru's special Sathsang on this momentous occasion. We were later treated to a soulful performance by the homegrown Sounds of Isha band which got everyone grooving to their rhythms and left all wanting more! We are looking for dedicated musicians to join Sounds of Isha in UK and warmly encourage you to apply if you would like to bring your talent to the fore! The celebrations concluded with a spirited volunteers meeting with many fresh faces raising their hands to contribute to the centre's growth and outreach. Their willingness and dedication made us feel especially privileged to be amongst such people! If you too would like to get involved, we have variety of opportunities to contribute not only at the centre but also from your home. Please fill out this form if you feel ready to volunteer! In July all our efforts were focused on raising the awareness of Isha Yoga. We are delighted to announce that we have launched a new Isha Yoga webpage for Europe and UK where you can now easily find the schedule of the centre and all the Isha programmes and events happening in Europe. Come check out the lovely new design at ishayoga.eu. The centre also offered more free sessions as well as the Hatha yoga guided and correction workshops. We are excited to see the enthusiasm with which these offerings to support the practices have been received - the free guided Shambhavi Mahamudra Kriya sessions at 5:45 pm have become a favourite with many of the office goers! Going forward, we are thrilled to announce the Isha Yoga for Children workshop from 21 to 23 August! Designed by Sadhguru, this workshop helps in instilling a sense of vibrant joy and focus in the growing body and mind of children through various fun-filled games and activities! We hope you will make use of this wonderful opportunity to aid in the growth of your tiny tots! Isha Shoppe products are produced in the rural communities of India with the aim of providing an outlet to express their natural instincts! They offer a true taste of the Indian mystical tradition. 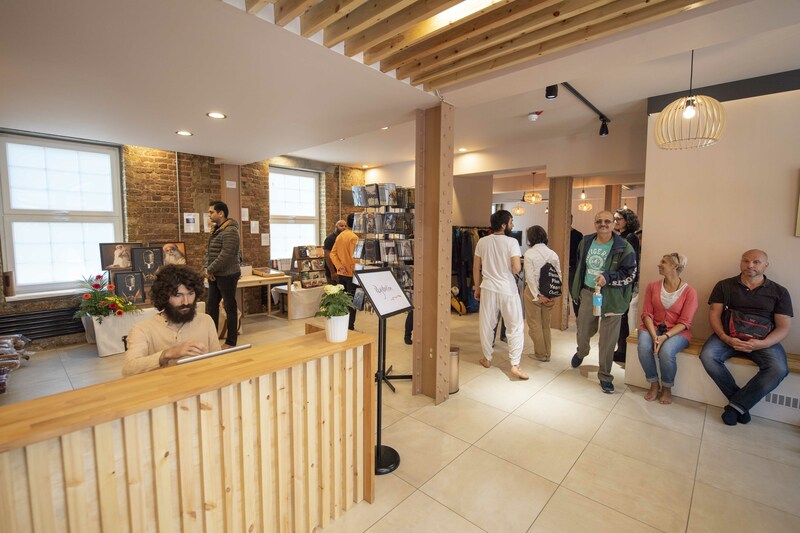 We are delighted to offer at the centre these intricately crafted products, ranging from organic clothing to handmade copperware to refreshing Ayurvedic skin products! The centre conducted 3 Inner Engineering Programmes in July, with the 4-day Inner Engineering Total standing out for the sheer number of participants. The class reached the maximum capacity well in advance and the vibrancy of activity at the centre amazed everyone and gave a glimpse of the times ahead! The strong record of successful Hatha Yoga workshops at the centre continued this month as well with 5 programmes being offered to enthusiastic response. The centre envisages providing continuous support to seekers to maintain and deepen their practises. In this step, in addition to the daily weekday Shambhavi Mahamudra Correction sessions, 5 guided Hatha Yoga sessions were also held for participants who have learnt Surya Kriya, Anagamardana or Yogasanas to refresh and reestablish their practises. We are encouraged by the willingness and commitment of the sadhakas and will continue to offer more such workshops going forward. As part of the outreach effort to engage more people with the simple tools of self-transformation, the centre conducted 4 Drop in sessions which drew curious newcomers as they got a taste of Isha with miniature hatha yoga sessions combined with a guided meditation that left them wanting more! "We have been able to establish the centre after more than 10 years of continuous efforts thanks to the goodwill and support of Isha meditators. It is now poised to lead the efforts in offering the powerful tools of yoga to raise human consciousness across Europe." You can support this endeavour by donating towards the running costs of the centre. Your donation can be on a monthly basis, or as a one-off contribution. No matter how big or small the contribution is, every penny will go a long way in helping the centre to thrive and expand. If you are UK taxpayer, your donation is tax free and eligible for Gift Aid. Please make your contribution by clicking here. I had the great privilege of playing music with the Sounds of Isha group for Guru Purnima last weekend. It was amazing to see how many people had gathered for the occasion in the London centre, and was really overwhelmed by the power of the energy in the space. It's been a while since I spent time there, and it really feels like it has been growing and developing in its power over this time...Once we finished playing I just couldn't hold back the tears, as though something deep within had been awakened and was desperately seeking to expand. It was such a beautiful experience to look around the hall and see so many bright and shining faces with eyes closed, swaying to the grooves...I can only express my gratitude to all of the meditators for making this such a beautiful event - and of course, to Sadhguru. For everything.